How they do it? I save the picture in my computer and still work. It is Animated PNG, which is supported by Opera and Firefox, but IE, Safari, Chrome not. So IE/Safari/Chrome shows non-animated content, while Firefox and Opera shows animated. it is working in opera! 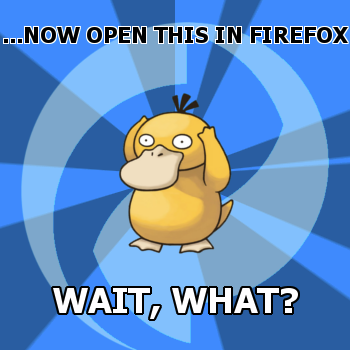 It works in Opera, well at least if I correctly understand what “works” mean. It “works” in a sense that it shows a different image than in IE, albeit neither of them is animated. if it shows a different image, then its working perfectly. don’t be confused by the ‘animated’ part. DOES NOT work with FF 4 !